Ozmuk Was a runt of an orc. Picked on by his brothers and sneered at by his elders, he would grow to despise them all. His only refuge was the old man in the Cabin. 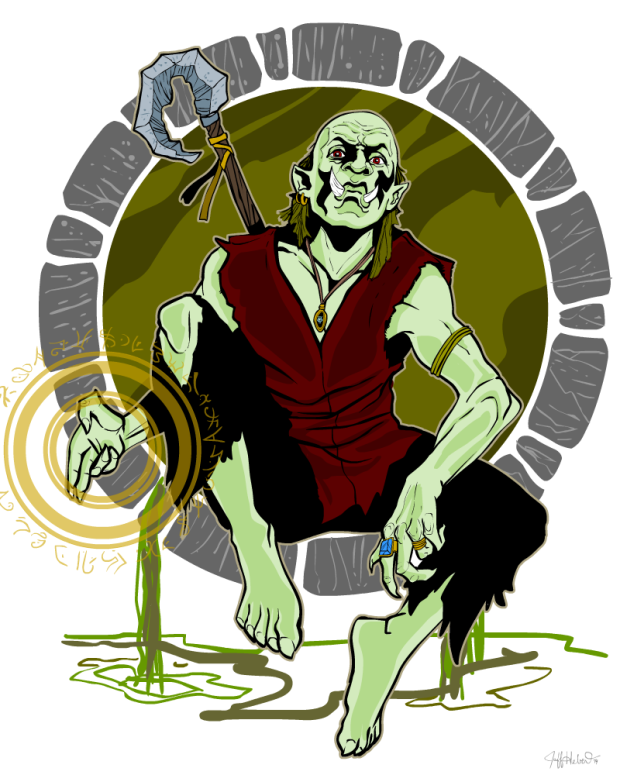 The Old man taught Ozmuk the art, and the dirty deeds he sought for payment were not too steep a price. Perhaps he even could grow to care for this Old Man. Then the Druid came and changed things forever. The old man burned. In order to survive, the young Ozmuk clung to the only one he knew - the killer. Soon after he was set free to return to his Tribe. They rejected him, of course. His pain grew too strong and he soon killed his brothers and parents. Ozmuk trusts few beings other than his rat, Dido. he spends most his time in the sewers of the cities so he can sneak into libraries to further his arcane knowledge. Recently he has been kidnapped and made a slave on a pirate ship. He is plotting, and he has already murdered 4 of the crew in their sleep. Villains are fun to draw! I know! I actually feel kind of bad about that, I didn’t notice it till I’d already finished and posted it to the thread. Sloppy sloppy sloppy!